Do you want to recreate this look? It has been one of our most popular men's fashion inspiration posts, so we're not surprised. We think it stands out because the focus is on the fashion, not the gadgets and accessories. It's a formal look, but with a bit of an edge. So lets break Nick's outfit down. If you have a pair of slim fit pants in your closet, give those a try. Even black skinny jeans work here--the important part is that they be fitted. That tight fit gives the outfit a hipster/rock and roll vibe, which is what makes it stand out from the more traditional Victorian men's looks. Try these slim fit chinos, or these extreme skinny fit Levi 519 jeans. If you're a little more adventurous, wear a pair of slim fit gothic brocade trousers like these. A white pleated front tuxedo shirt is next. Notice that Nick's shirt has a "winged collar"--this is known as the more formal collar style and it was very popular in the early 1900s. Here's a tuxedo shirt nearly identical to Nicks, but you can also venture out into other tuxedo styles, like this high collar Victorian version, or this club collar version. The club collar originated at Eaton college in the late 1800s, so it's also known as the "Eaton collar". Nick's waistcoat has a bold pattern, but the brown colors keep it toned down. This brocade waistcoat is a nice choice. If you're looking for something with more vibrant colors and patterns, check out the waistcoats in the etsy shop, DASOWL. Add a brown ascot like this, or make you life easier with this version that's already been tied! We love the subtle paisley pattern. The jacket is a tuxedo jacket with tails (aka 'tailcoat'). You could opt for this traditional tux jacket and swap out the black buttons for these brass buttons, or try this cotton velvet costume version. Even better, check out this tailcoat by Bleeding Hearts with a split swallow tail. It will put the PUNK in your Steampunk outfit. Tall Abe Lincoln style top hats are very common in Steampunk fashion, so it's nice to see Nick in a shorter version. 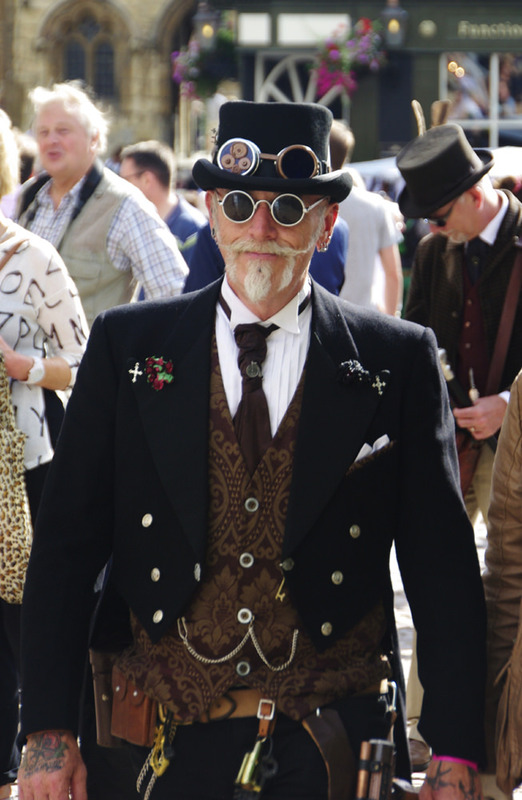 This wool felt short top hat is a great choice, with a pair of goggles like these slung casually around it. Nick's round sunglasses give a rock and roll vibe, but they are fairly historically accurate. Round eyeglasses were the popular style in the 19th century, although sunglasses were more of an American thing than a British trend. Here's an affordable pair on Amazon. You should also be able to find a pair at your local sunglasses shop. To finish off the look, add some pins to your jacket (we think Nick's crucifixes--like this one--look cool, but anything works here, like this gothic victorian inspired cross or this Gear Wing pin). Look through your old jewelry, make some yourself, or take a deep dive into Etsy to find something really unique. Add a pocket watch, winding the chain around the buttons of your waistcoat before tucking it in a pocket, as Nick has done. You can add on more accessories or props, but we think less is more in this situation. Let the fashion be the focus, not the props and gadgets. For more guides like this, check out Recreate This Look. If you need shopping resources, visit the Where to Shop page.